PHOTOS: NDP Justice Minister Kathleen Ganley at yesterday morning’s press conference on Bill 1, An Act to Renew Democracy in Alberta. 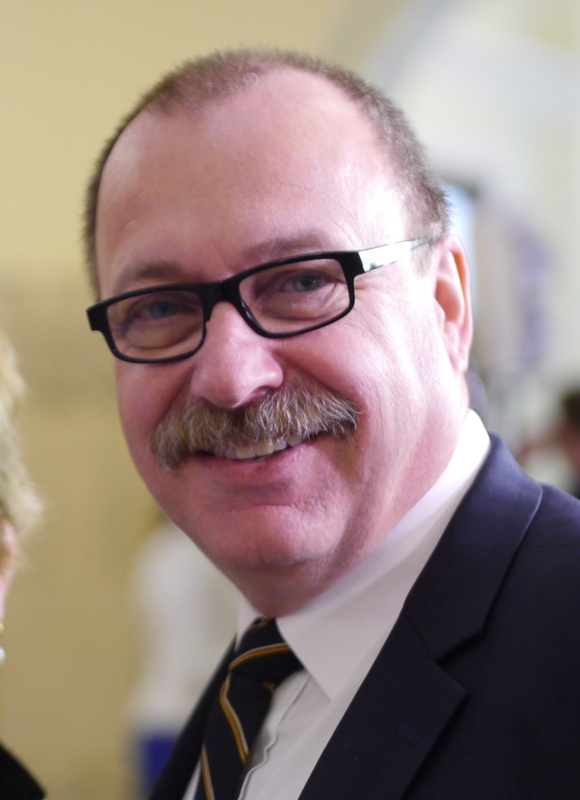 Below: Premier Rachel Notley, PC Leader Ric McIver. With Bill 1, An Act to Renew Democracy in Alberta, there can be no question that Alberta’s NDP government is playing hardball with what’s left of the shattered Progressive Conservative Party. At a news conference in the Legislature yesterday morning, Justice Minister Kathleen Ganley confidently trotted out the government’s talking points on why the cabinet banned corporate and union donations, why they banned them now, and why other changes will wait until later after a multi-party committee has taken a look at the whole question. All Albertans understand the argument for a ban on corporate and union donations, even if they don’t like the idea for one reason or another: Big money from big organizations tilts the playing field in favour of some parties, and the biggest organizations with the deepest pockets are corporations. Most Albertans seem to think it’ll be good for democracy in this province if such donations are eliminated, although in time there are sure to be U.S.-style court challenges alleging preventing legal “persons” like incorporated companies from donating to political parties restricts “freedom.” There are also bound to be legal attacks on future spending limits, along the lines of the Citizens United case that has seriously eroded democracy south of the 49th Parallel. As for the question of why now, when more campaign finance reforms are needed and indeed planned by the NDP, Ms. Ganley smoothly made the case that the corporate and union contribution ban was a specific election promise made by Premier Rachel Notley and therefore the government felt obligated to follow through immediately. It’s hard to argue with that, and it’s hard to believe the change won’t be very popular with most Alberta voters. Indeed, the idea is so well liked the notion of extending it to municipal election campaigns, first suggested in the blogosphere by political commentator Dave Cournoyer, is catching on as well. Yesterday morning, Edmonton Mayor Don Iveson called in a Tweet for similar restrictions to be imposed on the municipal political arena. Just the same, the fact Alberta’s huge, Wild West-style allowable campaign contributions remain untouched by Bill 1, and some other urgently needed fixes have also not been included, is bound to raise questions about why the Notley Government is proceeding so quickly with seemingly incomplete legislation. At the risk of mixing metaphors, there’s little question the decision to enact the legislation immediately, especially the provision to make it retroactive to June 15, the day Bill 1 was introduced, fires a torpedo right into the side of the not-so-good ship Tory, which has been taking on water since well before the election. The PC Party at least $1 million in debt, and possibly half that much again. There are questions about whether that money can ever be repaid. Directors of the unincorporated society that runs the party are edging toward the lifeboats with statements in hand that they will not be held responsible for debts incurred without their approval. Too much of this kind of thing could send the party straight to the bottom. Judging from the momentary smile that flitted across Ms. Ganley’s face at yesterday morning’s presser when a reporter wondered what the hurry was all about when the PCs still had promises outstanding from corporations for donations, it seems quite likely she understands this perfectly well. 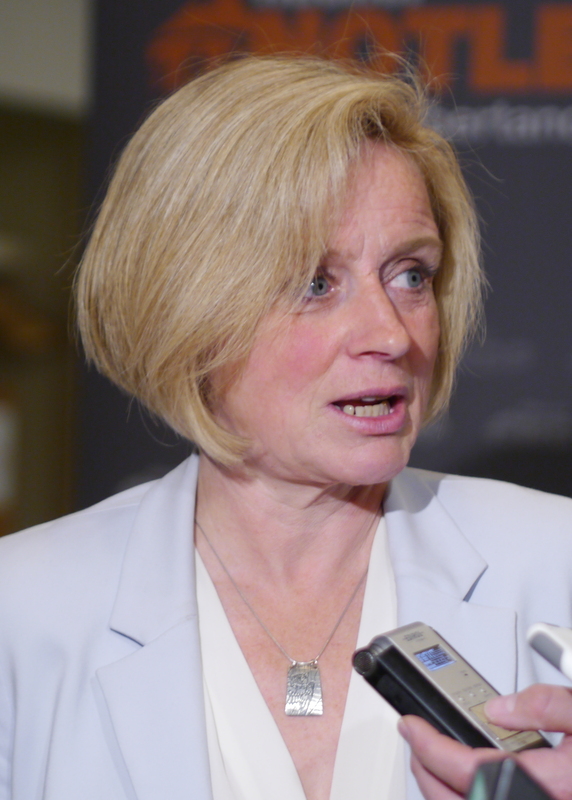 However, she smoothly explained that it’s important to Albertans that the NDP keep its promises and that the province move as quickly as possible to a level political playing field, which is in the interest of voters. It was to Ms. Ganley’s credit that instead of laughing out loud she responded respectfully, both at the news conference and later in debate in the Legislature, to questions about PC leader Ric McIver’s allegations that by levelling the playing field the NDP is actually tilting it in its own favour. The PCs’ real problem is that election writs last 60 days, and they presumably thought they had until after Canada Day to collect the pledges made by some of their (former?) corporate friends to help pay off their debts. With the party now reduced to third-party status in the Legislature, no chance it will form a government any time soon, and very little chance it will form a government ever again, some of those corporations that might have followed through on their commitments may be relieved they will be prevented by law from doing so. There is now absolutely no way a desperate, last minute pledge drive can be legally launched by the foundering former governing party. This leaves the Tories – and especially the party’s directors, who may be on the hook for the debt without a shred of corporate protection – in a bad, bad spot, or at least depending on the mercy of the party’s creditors. This post also appears on Rabble.ca. Note: I will be on the road for a few days, which is bound to have an impact on my ability to file commentary daily. I’ll do my best based on mainstream media reports from relatively afar, but I’m not making any promises! The reason why political financing and spending limits can be sustained by the courts in Canada, where they can’t in the U.S., is fairly simple. Unlike the Canadian Charter of Rights and Freedoms, the U.S. Constitution, with its Bill of Rights, has no “reasonable limits” provision. This clause in our Charter, which is in fact Clause 1 (see below), prevents the sort of extremist interpretations of rights and freedoms that have kept the U.S. from being able to implement common-sense limitations on firearms ownership or campaign spending, among other issues. So, any right-wing nutbars that seek to challenge such laws in the courts face a steep uphill battle. I’ve said this before; good riddance to bad rubbish! My hope would be they go after the electoral boundaries next! Having said that, I feel that Alberta needed a major shake-up after an intolerable 44 years under Tory rule, where privilege and self-entitlement became indelibly stained into the brand. I think a stint by the NDP in government will be much more healthy than another 4 years of Tory misery. @GregP; nicely said! I can imagine the fight she has on her hands with the old guard right now. Keeping them in line is harder for her than Governing. There is a shitload of changes that can be made to make this province spin differently. Other than electoral Boundaries there is the fact Alberta does no collect estate taxes while the aging population does not have home hospice that is available yet in BC. On one side I can see a whole new rank of home help and public employment on its way and on the other a chance we will have estate taxes to pay for it. I have never met Notley, I have never talked with her. I sent her a message at info ndp email saying I would support them this election and never got a peep after that. I had really expected a “thank you, John you did good” note but, no thanks coming my way I’m afraid. Perhaps some of those nervous directors of the PC Association were clinging to the faint hope that some corporations would help bail them out at the last minute – oh well. Of course the NDP doesn’t owe them any favours and the voters are generally fine with the NDP keeping their promises as quickly as possible. In this case it is also a very easy promise to keep, as the new official opposition was also not a big fan of corporate and union donations. If the PC’s want to blame anyone for their sad state of financial affairs – sorry I can’t resist, they should look in the mirror here. It was their own leadership that made such a mess of things. Mr. Prentice may be a fine person in some ways, I don’t know him at all, but as a leader he also had a responsibility to manage the party’s finances well. However, it appears he has now left the party with a financial as well as an electoral mess. I recall some years ago the leader of another provincial political party overspent badly in an election campaign and it took years for the party’s finances to recover. It is a great betrayal when a leader causes such lasting damage to their own party. The PC’s can disagree with the new legislation and it is certainly true that it does not benefit them as the old system did. However, the NDP is not to blame for the financial mess the PC’s now find themselves in and the new government should not be expected to delay implementing new rules just so the PC’s can have some faint hope for a bit longer to fix their problems. I very much like your column but wish that the print wasn’t so small and faded from a solid black. perhaps you need a different font? Serious; time for an eye checkup and if that is okay a new monitor? Banning corporate donations is nothing short of communist and anti-democratic. Shame on the NDP. This will come back to haunt them as the public won’t stand for this bullying. The public is not corporations. In point of fact, the true enemy of democracy is corporatism. We’ve reached the point where corporations control and dictate to governments what is best for themselves at the expense of the environment, and other public goods. Governments, including the legally elected NDP, are the instrument of the public will, and not the puppets of the corporate elites. That is democracy! Democracy is supposed to be based on citizens for its legitimacy. They are a type of group. Legal constructs. A society that privileges the economically powerful groups in politics is known as a corporatist society. Corporatism was the political system upon which Mussolini, Hitler, Salazar et al built their fascist regimes. The PCs, once Klein’s gang took over, entrenched the corporatist mode of politics. Left us with a veneer of democracy. Citizens in a democracy should be political equals but in capitalist economies the economic power of corporations usually dominates politics. So to achieve democracy, corporations should actually be prohibited from any form of political lobbying. Not just donations. Lobbying registries and other legislative normalizing of lobbying have effectively made corruption legal. The definition of corruption I mean here is when elected representatives are lobbied to put private interests before the public good. e.g. Putin’s favoritism toward is oligarchic buddies in various industries epitomizes political corruption in this sense. Preventing corporations, as much as possible, from using their economic power to corrupt our politics will be seen as the NDP’s signature policy. Serious history making stuff. This was interesting. I missed the two points that you brought up in this post. 1) The first point I missed was the business of the contribution limits remaining unchanged. The contribution limits are unchanged so that any citizen can contribute up to $30,000 per campaign minus any other contributions made in that calendar year. The other donation limits are unchanged. It seems odd to me that the NDP would allow these excessive donation limits to continue until there is a broader review of the Elections Act. Contribution levels will remain unchanged, pending a broader review of the Elections Act, announced by Premier Rachel Notley. This set up seems a bit disingenuous to me. Why do you need to consult with anyone to decide that these contribution limits are too rich? I mean the PCs never consulted with any other political party in deciding to keep these hyper-inflated contribution levels so why wouldn’t the NDP change the contribution limits NOW? You don’t need consultation in this case so this must mean that the NDP is interested in some other goal. So what other goal would this be? This failure to reduce the contribution limits, suggests that the NDP want to ensure that they get enough money in this gap period—from donors who might be inclined to be generous now that the NDP are forming the government. This sort of junk might be a politically good move but it isn’t ethical. Giving citizens half the loaf isn’t the full loaf is it? The NDP should have capped the contribution limit right away. If they can stop the donations from unions and from corporations why couldn’t they have decided on a specific donation limit based on the contribution limits in other parts of Canada? 2) The second point I missed that you pointed out–was that the act comes into force on June 15, 2015. This means, as you noted, that the PCs will not be able to collect from their usual donors starting immediately. Since they have spent like Christmas shoppers in this unnecessary provincial election in the belief that they would be re-elected by stupid Tory voters like myself, they are now in major debt. This is a good reason why the PCs should have learned fiscal prudence. They would not be in such a sorry financial situation if they had been frugal with their own cash (of course they would still have been fiscally imprudent with public cash but that’s a dominant trait of all politicians). This was a very canny move on the part of the NDP. Not only do they look good to citizens by giving us half the loaf (but not the full loaf), they also cripple the PCs. I begin to wonder if the NDP have learned political strategy from the PCs; this seems such a dark move. The PCs will not be able to recover financially now unless they can get a whole pile of citizens to replace their corporate donors. Maybe all the corporate donors will give them cash as private citizens? It could happen. The PC party may rise miraculously just like the NDP did in Alberta but I doubt it. Miracles only happen every 44 years in Alberta. I hope that the promised election reform will include the reform of municipal campaign donations. The flow of cash from developers to councillors should end; I don’t believe any of the politicians who tell us that they are not influenced by the major donations of these folks. That’s rot. The only reason the developer base gives to the municipal candidates is to be favoured by them. You only have to look at the SNC-Lavalin case in Quebec to see how the democratic system is manipulated to ensure that money given is returned. This company seems to be above the laws of any country it does business in and why would we expect that it is any different in the way it conducts business in Alberta? For all we know the corruption may be even worse than it is in Quebec. We’ve got no sort of investigative journalists left in Alberta that I can detect to do this sort of work and even if there were journalists willing to do this sort of corruption probe, I’m betting their reports will go unpublished. But maybe we don’t need to have a corruption probe. We just have to look at the Katz Arena to see DeMockracy in action and developer tax dollars in action. In Alberta, corruption seems to be flagrant and in your face. But here, they just call it good business and downtown revitalization. I think corporate and unions should be able to donate to political parties, but the limit should be the same as a real person. Also, there are still ways to get around banning corporate and union donations. Corporations can ask the Board of Directors and their immediately family members, as well as their employees to donate in a personal capacity. Will people please stop exaggerating the supposed awesomeness of bill 1? This should have been a slam dunk for the NDP. Campaign finance reform fits with their ideology of balancing the scales in favour of the poor, it is politicly popular, and it benefits them during campaigns at the expense of their opponents. It is the exceedingly rare triple win in politics. Instead the completely flubbed in in not one but two ways. First, they didn’t change the contribution limits, meanings anyone can still donate 30k, many multiple more than most other Canadian jurisdictions. Do people not realize corporations are not some evil sentient entities in and of themselves? They are composed of people–and the higher income executives and the wealthy shareholders can still donate absurd amounts to any party. To make matters worse, they don’t even have to go to that extent–the law has catastrophic loophole that allows corporations and unions to lend to parties.